Mikarik plucked at the data pad and a dozen articles were projected in front of his face. He scrolled quickly through them, catching headlines and bylines from Thorian, Mraboran, Hatvan news sources and beyond. The Thorians haven’t invaded a non-space faring world since the early days of the Empire, this was, unusually brazen and he experienced that rare feeling where he itched to tap into the general mood. “So what do you think?” She finally asked as he pursed his lips staring up at the information in front of him. “But surely there was some far Vaparozh colony that would have been enough. To do this to the Krevali …” She trailed off as if leaving him room to either agree or disagree. He knew what this was, although the feeling was foreign to him, this invitation for empathy for sentient beings who were not Thorian. It seemed to come easily to all the other species, this manufactured idea of a level of equality. It was a weakness that had allowed the Empire to grow and consume more than a third of Livespace. The Mraboran let out a short surprised growl. This time it was her turn to avoid his gaze and she stared into what he presumed was an empty mug as he tapped his pen on the table. “Did you enjoy your tea?” He finally asked. “I’ll be sure to do that.” He gave a small nod and watched her head for the door. They slid open as she approached and she turned her head in his direction with a smile that only revealed her canines. “Maybe.” He wasn’t sure if she’d heard him before the doors slid closed behind her as he was left alone for the last time. The dining hall was now filled with nothing but the hum of the ship, which left an uncomfortable amount of room for Mikarik’s thoughts. The articles must have beamed out about a week ago, which means it had been at least three weeks since the invasion; three weeks since he should have sensed the first ripple of excitement in the Thorian empathic consciousness, which would have swelled to near euphoria as the news spread around the Empire. Joy at the prospect of the return of the glory days, joy at the expansion of the Empire, which meant more living space, more Thorians, and therefore more voices to raise the mood of the species. Instead the inside of his head felt like the dead of space. Supposedly it was how all other sentients felt like, completely disconnected from other members of their race, trying to yoke their distinct individuality together for common goals. The enemies of the Empire, which, for all practical aspects, was everyone who was not the Empire, used this to stoke fear of the Thorians, arguing that experiencing collective empathy created an arrogance that by extension deemed all others inferior. And though he conceded that there was truth to this suspicion, he felt, in whatever atrophied organ that didn’t allow him to tap into it, that it was the most noble trait possessed by any species yet encountered. He poked around in the silence, like he always did whenever he faced his deficiency so starkly, but any mood he found was entirely his own, and largely influenced by the Mraboran. During the whole conversation, her tail stayed perfectly still, which everyone knows is a sign that a Mraboran is lying. That is, everyone, but the other “everyone” who knew that a Mraboran’s tail twitches every time they lie. Same goes for whether their ears are completely flat against their head or poke out every so slightly, and whether they’re mostly showing their left or right canines. There’s often a lot riding on whether a Mraboran is telling the truth or not, and despite the high stakes, no one has been able to crack it. Mikarik had his own theories, though none particularly sound. What was obvious to him was that she was sent to speak to him by one of his handlers, but which one? It hardly mattered now and would likely be six months when it wouldn’t matter at all. In the meantime, he had about a week left to torment his notebook until he arrived on Earth, after which another couple of hops and skips were supposed to lead him to the to the human colony where his trail was going to go cold. He wondered what to do with his completed notebooks. Perhaps, he could drop them off at a courier and ship them to his mother. Should only take about a year to get there. If all went according to plan, and by all accounts it should have because he was due, within a month he would boarding the research vessel Forseti in his new role, a Thorian traitor to the Empire. “I’ve had longer,” he lied; now was as good a time as any to practice. “Well you know what they say, a Thorian’s got time to spare.” The “they” of course were only Thorians who lorded their longer lifespans over almost every other sentient species. He loathed when other Thorians did it, but accepted that hypocrisy and self-loathing go hand-in-hand. Those narrow feline eyes flashed at him with a lack of patience and she pulled a communication pad out of her pocket and turned her attention to that. Mikarik turned back to his notebook, to agonize over synonyms and metaphors and scratch at the three cranial bumps running down his forehead, vestiges of a time when Thorian males slammed their heads together as a means of winning favour of unimpressed females. Every Thorian with the exception of his mother has mentioned to him how small his were, and many suggested how easy it would be to cave his skull in with a single slam, despite the fact that anyone who would be even remotely impressed by this display would be fellow brick-heads. Few had actually tried, and of those that did, none tried more than once. At least for this reason, he was quite pleased by them, even if they did itch something fierce whenever his mind was particularly preoccupied. Three months he had been at it, and this was his fourth notebook, and every day he thought he was making progress until he read his writing the following day and convinced himself he had the eloquence of a toddler. In that respect, at least, he felt like a true writer. These efforts were difficult enough, but feeling her glance at him every couple of minutes didn’t help. He told, her. She laughed. “Oh, I remember now. You can’t combine things with certain adjectives. Like you can’t say uhh,” her hand went behind her head, giving it a satisfying scratch. “Angry wind.” They said in unison, though Mikarik’s outburst was far less enthused. He wasn’t particularly keen on how many times this has been quoted to him, an inclusion in some two-bit traveller’s guide that got reprinted across every corner of the Known Reaches. Funny how most of them didn’t bother to include the other little tidbit that he was about to spring on the Mraboran. Mikarik permitted himself a smile and leaned back in his chair. “Clearly I’m becoming predictable. But one word I’ve always liked is ‘netkarthai’. Hard to translate, harder still to understand. But it means something along the lines of “invoking a fear that one will never hear their loved ones again”. It also formed the basis of the word ‘netkarthi’, one of the many words of varying levels of derision that were used to describe the “severed” – those who were deaf to hive empathy of the Thorians. Just speaking the word put a dark shroud around the room that flooded into Mikarik’s mind. This focused darkness is what he used to make the reckless decisions that gave him his medals and his battle scars. “That’s the hope.” He responded and turned back to his notepad, still sensing her eyes refuse to release. Hello reader, and welcome to the online sci-fi serial, Drops of the Black Sun. You can start by reading the introduction or browsing the table of contents, or feel free to jump into the first chapter below. Enjoy! The thrum of the ship as it skidded along the surface of subspace is what chased most into their stasis pods for the duration of the journey. For Mikarik, it was the sound of home, of a reprieve from responsibilities or the unforeseen twists that life had such an unpleasant habit of delivering. It was the pause between the times when choices needed to be made and when decisions mattered. He never understood his fellow passengers who crawled into their pod the moment they came aboard, and went into an empty sleep that terminated days, weeks and sometimes months later, after the ship had already safely docked at the end of the journey. Granted, they banked some of that time, it being generally believed that one ages at only one-third the regular rate while in stasis, but were a few meager years at the end of one’s life really worth the wasted opportunities? Mikarik slept only when he was tired, retiring for his usual fourteen-hour sleep cycle, without any regard for where his biological clock would end up needing to be calibrated. It hardly mattered considering it would often need significant readjusting when he arrived. The destination always had its own rhythms. Its own time and length of day, its own peak of activity whether it was high noon or the dead of night or the temperate spaces of dawn and dusk where it neither threatened to freeze you nor boil you alive. And in between the inconveniences of having to replenish his energy, he ate, and read and wandered whichever sections of the ship where not closed to the public. Encounters with others were usually scarce, as most preferred the get-it-over-with option of submitting to near-death. Sometimes he spent days without interacting with a single sentient, but he was rarely alone for long. Though few shared his appetite for an entirely solitary and wakeful journey, others often woke up along the way and depending entirely on their personality and Mikarik’s moods, provided welcome company. The long-haul passenger cruiser he currently found himself on, and likely the penultimate trip he would ever undertake, had left Vaparozh three months prior, and would be docking in orbit above Earth in less than a week. It was one of the longest voyages Mikarik had undertaken, and even he felt as though he was on the verge of going stir crazy. Like all ships built on Vaparozh, it was structured to accommodate their strictly gender-segregated yet somehow austerely egalitarian culture, with one dining hall for the males, one for the females, and a small and run-down hall, where Mikarik spent most of his days, for those passengers that came from barbaric cultures that allowed their genders to co-mingle during such holy rites as eating and sleeping. He had been largely alone for over a week, as even restless travelers preferred to catch up on sleep just prior to their destination, which left him plenty of time to aggressively tap his pen against a blank page in his notebook and summon words that refused to do his bidding. He thought he was being amusing when he chose posing as a poet as his cover for the trip. Instead, he unwittingly subjected himself to the a frustration he hadn’t felt since spending weeks pretending to be helpless and adrift in orbits of rocky moons waiting for pirates to strike. He expected no more company for the remainder of the flight when a very groggy and disheveled Mraboran female entered the hall and appeared either startled or confused at finding him there. “Good morning. Please, don’t mind me,” Mikarik said in Common Pidgin as the Mraboran ran her hand through the tangled fur on her forehead, clearing it out of her golden eyes. “I didn’t expect anyone else to be up.” She responded in fluent Thorian that betrayed the barest hint of an accent. “Neither did I, but here we both are.” He switched to his own native tongue and watched her through the bottom of his water glass. She walked over to the food dispenser, which served slim pickings after a long-haul flight where most passengers were expected to forgo eating in favour of stasis, and ordered a cup of something fragrant and steaming. Nothing Mraboran as far as he could tell, a floral scent he couldn’t identify. “Ah.” He’d encountered humans before and was vaguely familiar with them, but they weren’t so eclectic that he would have any exposure to their cuisine. Between the fluent Thorian and the human tea, this Mraboran seemed to go out of her way to show him how cosmopolitan she was. He scratched a couple of words in his notebook, as she took a seat across from him and watched him over her mug, inhaling its vapours. To the untrained eye, there was no discernible difference between Mraboran males and females. Both were covered with the same short sleek fur that ranged from dusty blonde to a shimmering copper, and both had the same sonorant voices with the slightest hint of a hiss. And while females were marginally more partial to using belts to strap their tails to their body, their clothing was generally unisex. But Mikarik had worked and lived among enough Mraborans to know that the key lay in the eyes. Males looked at you with a round dumb expression that was perpetually surprised. The females’ eyes were narrow and cunning and constantly sized you up as potential prey. Even hundreds of light-years from home there was no getting away from evolutionary biology. “You should try it, helps you get back to sleep when you’re knocked out,” she suggested after taking a long sip from her mug of chamomile tea. “I don’t get knocked out,” Mikarik responded without lifting his eyes off the page. “Pretty quiet, actually,” he put his pen down and his eyes met hers. He was at an advantage there, with his mostly shaded by his implanted glasses. The Vaparozh sun was a scorching ball of yellow flame even brighter than most of the suns of the habitable worlds, a stark contrast to the dim red glow on the Thorian homeworld of Kai Thori. He spent the first week of the journey trying to find a way to dim the lights and eventually gave up, ending most of his days with a headache. I have something very exciting to share with you. Okay, I lied, I have something very exciting I’m about to share with you, and I wanted to introduce it. Those of you who have been following my blog will have acquired an awareness that I’m not primarily a genre author. Both the novel I’m currently editing and the one I’m currently writing can be best described as literary fiction. Not to say that I have any aversion to genre fiction. Most of my early short stories were science fiction (think really crappy Black Mirror episodes), and one project in particular has been growing in my head for a decade and a half now. And it’s this project that I want to talk to you about today. Drops of the Black Sun has its roots all the way back in high school. Having grown up on Star Wars, Babylon 5 and to a certain extent everyone’s unfavourite Star Trek series, Voyager, I have always longed to create my science fiction or space fantasy universe. It was one of those ideas that I always believed in but knew for the longest time that I did not have the requisite ability to give it justice. It has suffered through many stages of the creative process since then. I attempted to actually put it down on paper once, and never got past the first chapter. To give you a sense of how the project has evolved since then, not a spec from that original first chapter, except a couple of character names, has survived into the vision I currently have for it. I’ve bounced plot ideas off my friends for years, being met with everything from encouragement to “this particular thing makes no sense.” I took every piece of feedback I received and threw it into the cooking pot that Drops of the Black Sun has become. For years I worked on additional plot lines, finding ways for them to intersect and grow in scope. I’ve worked out additional details of the universe going on for years in each direction to make the world seem more dynamic and “alive”. I rewatched Babylon 5, read and watched Game of Thrones, and the Kingkiller Chronicles and dabbled in the fine line between inspiration and plagiarism. I’ve noted similarities to other works and tweaked them into something different or else embraced them and made them my own. It’s amazing how much goes into a piece of work that’s not necessarily “writing”, which again why I think one should not define their writing by soulless “words per day” goals. If you are truly a writer, then it doesn’t matter whether you have a pen in your hand. Your mind is always working through ideas and plot and dialogue. So much of a writer’s craft happens in their daily life, and I’ve extolled the virtues of this “off the page” writing on multiple occasions. However, every piece of advice can go too far. Over the last few years, Drops of the Black Sun has been stuck in worldbuilding hell. I’ve convinced myself that I can only return to writing it once every meticulous detail is in place; only when every character has a name and complete biography, every alien race has a name and history and the all the star systems have been mapped and their political relationships defined. For some writers, this works, but in my case, the project was tied to an unrealistic goal. And so as I was reflective on my last year in writing, on my successes and how to grow them, I decided that perhaps this would be a good time to stop procrastinating. I feel reasonably comfortable with the framework I have in place so that the story won’t get away from me, but at the same time, I need to start growing it organically. So I’m excited to announce that starting next week, this blog will become the home to Drops of the Black Sun, which I will plan to release in somewhat irregular intervals over the course of the next whenever, since I will be posting it at the rate that I write it. I want to do this with a manageable schedule and in manageable chunks as I don’t want my other projects to be sidelined. But because this story is always itching to be written, I think this will be the perfect opportunity to allow myself an outlet, and finally share with the world something I have been working on for basically half my life. So here’s hoping that it catches your eye, and that you stick around through the adventure. "Nightfalls" Published in Nashwaak Review! ​A year ago, shortly before I started this blog, I was a writer with only a single published credit to my name – a third-place finish in a contest run by a trade journal. Just under a year later, I have three literary journal publication credits, and recently reached a new exciting milestone – my first publication in a physical printed journal. Yesterday my copy of the Nashwaak Review Volume 40/41 arrived, and it contained one of the most exhilarating things for a writer – my name in print. Although I talked a bit about my short story “Nightfalls” and its acceptance last year, I once again want to thank everyone involved with the Nashwaak Review at St. Thomas University in New Brunswick who saw merit in my story and thought it was worthy to be published in their journal. Without your hard work and dedication, writers like me may never be able to find a platform to share their writing. It was pretty exciting showing the journal off to everyone, and particularly pointing out to my kids their dad’s name in the journal. They’re both huge bookworms and it was such a special feeling showing them that their dad contributes to these things, too. The older one assumed it was a published version of the bedtime story I’ve been crafting for them for weeks, and I said maybe one day. Because this is a print publication I’m not able to share it with you directly, but you may find it at your local library if you’re in the New Brunswick area, or else order it from them directly. Either way, I wanted to talk a bit more about the story itself, hopefully serving up some helpful advice along the way. Without retelling the whole story here, I first want to touch on what Nightfalls is about. The premise is that one day, the sun sets and it never rises again. Eventually, the light from the moon and the stars also disappears, and humanity is forced to create its own cycle of day and night by regularly shutting off all the lights and plunging the world into impenetrable darkness. The story follows the protagonist, Jonas, as he struggles with his own feelings of hopelessness, despair, and apathy in a world cast into inexplicable darkness, until he discovers something that may just bring back a light of hope into a dark world. As you can see, an element of magic realism that was present in my first publication, Ursa Major, and to a lesser extent in Slippers, is also present in this story. It seems to be my most successful genre so far, which has got me to rethinking my writing lately. Often I hear of new writers who say they’re bursting with creative energy, but they don’t know what to write. I think “Nightfalls” is the perfect example of the fact that inspiration can strike from anywhere. I was driving down a dark highway from a friend’s wedding, contemplating my existence up until that point, and wondered what it would be like if the streetlights up ahead were the only light left in the world. Granted, the formation of the story itself was more involved than that, but that is essentially all it took – a single thought on the drive home. So if you want to be a writer, and you’re searching for something to write, don’t try to have the next great novel implanted firmly in your head before you write the first word. All it takes is a single image, as ephemeral as a shooting star, to start putting your story together. “Nightfalls” ended up being deeply personal to me. Though starting off as a casual thought it quickly grew into something bigger. If I recall the timing correctly, I had just graduated with my Bachelors and was ready to go to law school. I attended the wedding of a good high school friend and ruminated on the difference between my high school self and who I had become four years later, perhaps convincing myself I was now so mature when the next decade would bring arguably even bigger changes. I needed to both self-reflect, put a lid on some things, and do something kind at the end of a long journey. So I ended up gifting this story to my married friend and her husband. While not a love story, “Nightfalls” is about hope, and every long-term relationship should be built in some way on hope. Hope for a limitless future with your partner. The story is about finding light at the end of a tunnel, and when you end up with someone you love as much as you love the whole world, that’s what it should feel like – that everything before was a little bit bleaker. Nightfalls was written ten years ago and it showed its age. My writing had advanced significantly since then, and it underwent a couple of “post-completion” revisions over the years. My wife has long tried to convince me to leave my old writing alone. She is right of course but there was something about some of those old stories I couldn’t let go. So as I picked up my publication efforts in earnest earlier this year, I thought that now that I was in my thirties I would give some of them a final coat of polish, promising myself that if they didn’t get published in this form to just accept it and move on. I don’t know about you, but I develop a sort of familial attachment to old completed works, especially ones that have sat in the “good” pile for so long. It brings me immense joy to finally see it succeed. But at the same time, I wound up sitting on conflicting feelings. On the one hand, I know I need to move on and not dwell over things conceived and written when I was essentially a different person. Yet on the other hand, I want to bring these stories to life and share them with the world. I think what it ultimately comes down to is the same thing that applies to any writing rules, and that is that there are no hard rules that are applicable to everyone in every situation. That’s why I recommend taking each piece of writing advice you sea not as a piece of a puzzle or another step in this grand instruction manual of writer-hood, but rather as an ingredient to throw in a pot. Some ingredients you use more, others less, the flavours interact with each other in different ways, and at the end of the day, you get the kind of writer that you’re comfortable with. So do you in the best way only you know you can. Those of you who have been following this blog for a bit know that I’m still trying to figure out how best to use this resource. Which made me consider that even though I have expressed how important I think reading is for a writer, I haven’t said much about what I personally read. So I thought this would be a perfect opportunity to share, and given that it’s still early in the year, and I have already expressed how obsessed Russians are with their New Year’s stuff, I would put together a “Best of” list for 2018. To start with a disclaimer, I want to say that due to work and home commitments, 2018 has been my worst reading year in about five years, so I won’t provide my embarrassingly short list of everything consumed and will try to conceal it as best as I can. I’m also one of those people who doesn’t care to distinguish between audiobook and written text. Sure, you’re technically not “reading” but you’re still consuming stories in a way that’s closer to reading than say, observing drama or television, so I think it counts. Having said that, I probably won’t be mentioning below which is which unless it’s relevant to my feelings on the book. Kingkiller Chronicle Day Two: The Wise Man’s Fear by Patrick Rothfuss. Earlier this summer I joined the legions of fans who are patiently waiting for the next book in the Kingkiller Chronicle saga. Fortunately, since my entry into this club is fresh, I am yet to join the other legions who are impatiently waiting for next one to come out. Either way, after taking several years to go through all the Song of Ice and Fire books, Kingkiller Chronicle is a refreshing read that doesn’t dwell on the doom and gloom. The world and character building is so detailed, however, that the pace of the books makes me think they need about 20 books and 200 years to finish. That said, despite the fact that I got myself into this fandom mess, I loved listening to this during my morning bike rides and runs. And knowing that Lin-Manuel Miranda is involved in an adaptation makes me all sorts of giddy for many reasons. Nicholas St. North by Laura Geringer and William Joyce. Ever just see a book in a store and then tell your friends how ridiculous you thought it looked and they bought it for you for your birthday because they knew you secretly really wanted it? Well that’s how this children’s novel came into my possession and I’m so glad it did. It’s the adventures of young Santa Claus in the days that he could be described as a “ruffian” and a “thief”. How could you not want to read this? It’s the first book in the whole Guardians of Childhood series and I’m not sure I’ll be picking up any of the sequels, but at the same time I had fun with the ridiculous premise and jaunty execution. Could have foregone a full two-page spread crapping all over my ancestors, but that’s beside the point. Altered Carbon by Richard K. Morgan. This was one I listened to on Audible and I think the experience was enhanced by Todd McLaren’s gruff narration of this hard-boiled detective novel placed in a sci-fi setting with excellent worldbuilding. The core concept of the novel, where human consciousness can be transferred to a variety of physical bodies, or “sleeves” thereby creating near-immortality, is taken to some very interesting places by Morgan. The Netflix adaptation, which I still think is a decent piece of television, tries to both condense and expand on parts of the story with varying effects. Overall I think the changes in the adaptation lead to a more sloppy plot with holes and inconsistencies, so I would recommend giving the book a try first. The Stone Raft by Jose Saramago. Once upon a time, sometime in undergrad, I set myself a goal of sampling the work of each winner of the Nobel Prize for Literature. What I was doing making such lofty goals when I couldn’t even keep up with the assigned reading in my English classes I’ll never know, but more than a decade later I’ve just cracked 25%. The thing about winners of the Nobel Prize, is that it the Prize itself has been criticized for picking obscure winners that are less than accessible to the general public. I’ve found my experience to be a mixed bag – I absolutely fell in love with the poetry of Tomas Transtromer but getting through Mo Yan’s Republic of Wine felt a big like running an uphill marathon drunk. Stone Raft, by 1998 winner Jose Saramago would fall somewhere in the middle of this scale. On the one hand, I quite enjoyed all the satire that grew out of the Iberian Peninsula’s sudden break-off and drifting out to sea, as it took digs at tourism, international and local politics and nationalism. On the other hand, his paragraph-long sentences and dialogue structure that’s presented in a single sentence with only commas indicating a change of speaker, was a challenge to say the least. Not to mention the multiple references to outdated gender norms which may or may not have been part of the satire but sometimes it’s hard to tell, you know. In the end, it was a book I was glad I had read. I don’t believe I’ve read anything by a Portuguese writer before, and it was nice to dive back into some magical realism while I myself am somewhat exploring the genre. Do Not Say We Have Nothing by Madeleine Thien. First off, this was an excellently written and deeply powerful novel with intricate characters that really brought the pain of their time to the surface. Well deserving of the Scotiabank Giller Prize that Thien won in 2016. So what exactly is my beef with it? The Cultural Revolution is downright terrifying. The ability of humans to turn on their neighbours, friends and even family in the name of survival is nearly limitless. And governments built on ideology, greed and a thirst for power can exploit that ability with frightening efficiency. So much of our western media, and particularly a relatively recent wave of young adult novels, portrays the eventual triumph over oppressive regimes. But if you want to read about hope dying under the treads of a tank, read Do Not Say We Have Nothing. For me, I’m going to take a short break from the bleakness of reality. I've spent more than a year discretely hiding this very in-your-face cover on the bus. Though it was a university bus so I probably fit right in. Che: A Revolutionary Life by Jon Anderson. Yes, probably the most “wtf” entry here. I’ve had a fascination with Cuba ever since I was a little kid, having visited a couple of times while my grandparents were stationed there during Soviet times (yeah, a whoooole many more stories coming out of this that I’ll save for later). So as part of my education on the subject I wanted to know a bit more about the Cuban Revolution’s most far-reaching figure. Some paint him as the devil, others as a saint, and I wanted a book that can do a good job of showing me where the middle was. Ultimately, the safest word you can use to describe Guevara is “complicated”. He led a fairly inauspicious life that blew up to global significance within a few short years. He somehow possessed a poetic love for humanity while also being completely numb to the value of individual lives when they face off against his political ideals. He managed somehow to both be a visionary and someone who often went way in over his head which resulted in disastrous consequences for millions of people. As you can see, there’s lots of aspects of Guevara that can be picked apart into various fictional characters, and I’ve already begun the process with some of my works in progress. So at least in that respect I’m glad I read this. As an aside, reading this book on and off over the last year also made me realize how important reading fiction is to my writing, and you can read more about that here. Alexander Hamilton by Ron Chernow. The really influential thing here is actually the Hamilton musical, but I think Chernow’s voluminous biography rounded out that experience quite nicely. Just go and read it, you won't regret it. There There by Tommy Orange. For a few years now I’ve attended the Vancouver Writers Festival. Not only does it encourage me to buy books I normally wouldn’t have picked up, but also sometimes I buy a gem like this one. It’s been a while since I read anything that felt like a true page-turner for me, probably The Golden Compass, but this one I was just hooked. The interconnected stories of Native American characters living around the Oakland area pulled me in and wouldn’t let go. It was such a richly varied cast that it made me feel almost as though I was there, observing both the struggles with things like depression but also the hope that is built from family and community. The novel of course touched on sensitive issues that I can’t even begin to understand, lacking the perspective being a non-white minority as well as the original settlers of the land upon which white settlers built their country. We face very similar but somewhat different issues in Canada and our own Indigenous population is probably the most marginalized in our society. Admittedly, I’ve been on my own slow journey to understanding that is still far from complete, but I’m glad for books like this because they showcase how important novels are in changing the world. I love New Year’s. As a Russian person I am pretty much obligated to obsess over it and structure my entire year around what happens on New Year’s Eve. There’s the Russian saying that “How you greet the New Year is how you will spend it” and this is just a hotbed for all sorts of neuroses and superstitions, which we Russians also excel at. And speaking of Excel, judging by my posts talking about bullet journal entries, it should come as no surprise that I have all sorts of spreadsheets that I use to collect data on my writing. 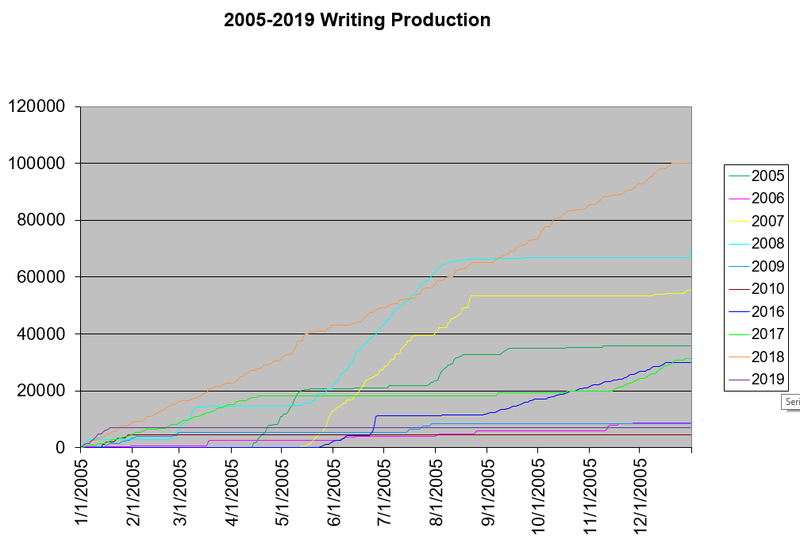 At a cool 100,000 words, this has been the most productive year since I started tracking. There is of course the disclaimer about the missing years but I doubt any of them came close. 2018 leaves second place (with only 69,000) in the dust. That year was 2008 and I spent the better part of the summer getting almost 50K words into a novel that I ultimately abandoned. Reaching this 100K milestone makes it a bit tough to have the 2019 top this output, but what’s life without a couple of challenging goals? My most productive day was October 10 at 1634 words. Wish I knew what it is that I was eating on that day so I can replicate this success, but oh well. I have not broken 2,000 words since the long care-free days of having a lot of time on my hands during summer. That’s fine, there’s always next year and it’s not like I’m going to beat myself up over it. Sometimes I have a day where I feel like I could go north of 2,000 but other responsibilities come calling and that’s okay. Writing may be your life, but life is still bigger than your writing. Your muse won’t retire just because you told it that you need a break for a day or two. Speaking of fickle muses. I spent 147 days not writing at all this year, most of them weekends, because face it, after I’ve put the kids to bed at the end of a long day all my brain is good for is to maintain vital bodily functions. This amounts for a seemingly horrifying 40% of all my days, but again, you can stare at the raw numbers and beat yourself up over it, or you can accept that you did your best in the circumstances. Sure, keep your eye on opportunities where you can write more, but I felt as though I had a decent writing year, and I’m going to go by the feeling, rather than the stats. On a similar note, the least productive month were August and December with 14 days of not having written a thing. Both of these were due to going on vacation, and for some reason I have a really hard time getting down to writing, even though I have so much to say. I guess the best alternatively is to write about it when you get back. And either way, those months might seem weak, but 14 days is still getting to write any other day, and if you’re like me and hold down a day job, writing every other day is a pace to be proud of. I know these kinds of numbers seem antithetical to the whole “write everyday” creed but man, love is such a complicated beautiful thing it's hard to find time to do the same thing every day even if it is something you love. Lesson here? Relax, right when you can and when you feel like it. Don’t make it a chore. There are plenty of those that will set hard targets for you making it sound as though you’ve completed failed as a writer if you didn’t meet those goals. I want to make it quite clear that I don’t subscribe to this kind of gatekeeping in writing. Writing for me is a constant journey. It’s not just a hobby, or something I’ve set out to do merely to challenge myself. It’s one of the ways I see myself. And this is the main reason why I don’t encourage defining yourself with words and goals. They’re a fun part of record keeping, and a nice way to motivate yourself, but they can’t grow into more than that. I once fell into the trap of defining myself by my production and the only thing that did was hurt my production. If you see yourself as a kind and funny person, would you accept someone telling you that you need to do x number of good deeds per week or make x number of jokes a day to be allowed to see yourself as such. No. Your trait belongs to you, and so you get to define what it means for yourself. That little word in my bio here, or on Twitter or Instagram that lists me being a writer alongside a father and a husband, and, to a certain extent, a lawyer, is not just a useful descriptor but goes to the essence of who I am. “Writer” is part of me, and like any part of a person, that part grows with me, it adapts with me, it responds to me as a person. So this year has not only been about putting words on paper, about starting novel projects or getting short stories published. It was also about learning and growing and moving forward wiser and hopefully better. I embraced my need to outline before I can launch myself into a project. I ruminated on where writing fits into my life and my relationship with my loved ones. I’ve worked out a way to get out of some instances of writers block. So in the end, I’m super excited about the words I will commit to paper in 2019, about the projects I will start and I will finish (fourth draft of my novel, perhaps? ), but most importantly, I look forward to all the things I might learn, and to share them with you here.